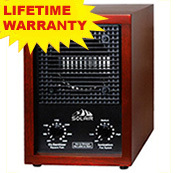 The LightningAir Industrial Cleaner is designed with the professional in mind. The heavy-duty O3 Sanitizer will remove strong odors from unoccupied spaces in a short period of time. Deodorizers simply mask odors but the LightningAir gets to the source of the problem. The Power of Nature Nature has many ways to produce O3 (a natural air cleaner). For example, we’ve all taken a walk after a thunderstorm and experienced the clean, fresh smell in the air. That’s ozone, or activated oxygen, at work. Activated Oxygen breaks down odors and other pollutants at their source. Normal oxygen O2 is converted to O3, which is commonly called ozone or activated oxygen. O3 will break down odors and other contaminates. The Industrial Cleaner employs a powerful O3 generator to achieve this natural process. The LightningAir IC-3 will oxidize odors and eliminate them. The IC-3 generates ozone internally and disburses it into the desired area thereby ridding the area of odors at their source. This powerful unit is designed for unoccupied spaces. The Portable LightningAir IC-3 can easily be moved from one problem area to another. 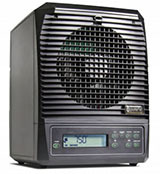 The Unit may be used for up to one hour of timed cleaning. It also has a HOLD position for longer term use. 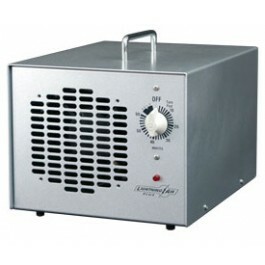 The LightningAir Industrial Cleaner can be easily cleaned and maintained. It has large durable ceramic plates that are removed through slots in the back of the unit and can be washed with a cleaner with bleach. 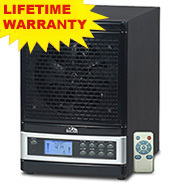 With the LightningAir IC-3 you can now quickly and effectively win the war against odors and their causes. This can help make your job easier and more profitable.